RxSorbo provides shoe insoles based on Sorbothane, a revolutionary new material. As part of a major website upgrade, the company has released a new information page on Achilles Tendinitis. Insoles for pain relief can be valuable component of the treatment of a common source heel pain, a condition known as Achilles tendinitis. RxSorbo, a leading online retailer of top-rated shoe insoles, is pleased to announce a newly released informational page on Achilles tendinitis and how shoe insoles can be used to treat the condition. If identified early enough, this foot ailment is amenable to postural remediation. Therefore, identifying symptoms early is an important step in determining whether insoles for pain relief are a treatment option. The new page addresses this need in an easy-to-read format. To browse the complete line of insoles available, one can visit the following URL: http://www.rxsorbo.com/insoles/. There, one can browse the company’s classic heel pads, classic insoles, and the company's whole line of walking shoe insoles. Interested parties are urged to read the blog category "foot ailments," as the newly updated pages are located under this topic. 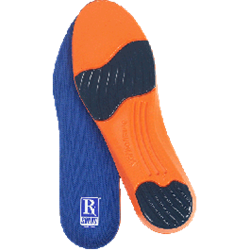 RxSorbo is the source for Sorbothane® Shoe insoles (shoe inserts). Sorbothane® uniquely absorbs up to 94.7% of impact shock, and makes for quality shoe insoles for many conditions. People come to RxSorbo for shoe insoles for foot maladies from Achilles tendinitis to Morton's Neuroma to metatarsalgia to many other conditions. From Shoe inserts for running to top-rated insoles for dress shoes to gym shoes, reviews of the company’s shoe insoles prove they are among the best shoe insoles.